Late at night, under twinkling stars in the cold emptiness of winter, his absence oblivious to his parents, Bill Gadsby routinely continued playing hockey on the frozen ponds of Calgary until he was either too exhausted to continue or too worried about the reception he'd receive when it was discovered he was playing hockey well past his bedtime. 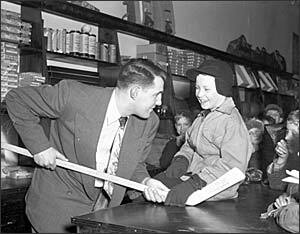 After one too many lectures from his concerned parents, Bill was facetiously asked by his father whether he had any intention of continuing is schooling or whether he intended to pursue hockey as an occupation. "Hockey," was all Bill said. Born August 8, 1927 in Calgary, Alberta, a hockey career almost eluded Bill Gadsby before it began. In September 1939, as the Second World War was dawning, the ship on which twelve-year-old Bill and his mother were traveling, the Athenia, was torpedoed and sunk by Germans, killing 112 passengers and crew. Both mother and son miraculously survived. Bill left home at the age of seventeen to play junior with the Edmonton Canadians, with whom he played for two seasons. While there, Bill Tobin, a scout for the Chicago Black Hawks, noticed the skill of the young defenceman and had him signed to the NHL club. 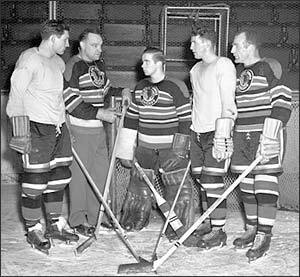 Gadsby was paid the then astonishing amount of $7,500 plus a $3,000 signing bonus and, in 1946-47, turned professional with Chicago's USHL affiliate, the Kansas City Pla-Mors. A combination of rapid development by Gadsby and dire straits by the Black Hawks elevated eighteen-year-old Bill to Chicago after just 12 games in the minors. In his inaugural NHL contest, Gadsby was welcomed to the Black Hawks with a cut to the face that took 12 stitches to close. "Before my father, Bill Sr., sent me off to play in the NHL, he offered me one piece of advice that I've always tried to follow: 'Never bring the game home with you,'" states Bill. "He made one other request that I've also tried to honour. 'Bill, I've given you a name with a good reputation,' my Dad said. 'I want you to keep that good reputation.' To me, what that meant was setting high standards for myself on and off the ice." While playing with the Hawks, Gadsby established himself as a terrific competitor who was equally adept at leading a rush as he was on the defensive aspects of the game. Bill could be an aggressive player on the ice (a (clean) bodycheck on Tim Horton in 1955 broke the Leafs' player's leg and jaw, almost ending his career) but whose calm demeanour off the ice was a paradox. "My father was a soccer player and, by all accounts, he was a rough soccer player," explains Bill. "I knew him as a man who won prizes for growing flowers." A second near-tragedy occurred in 1952. During training camp, Gadsby contracted polio, almost concluding his own career. Bill recovered quickly and was able to continue his blossoming career uninterrupted. 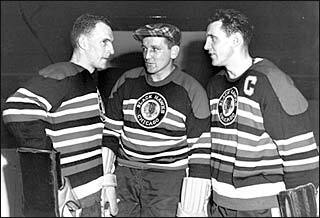 In fact, twice while playing with Chicago he was selected for the NHL's Second All-Star Team (1953 and 1954). 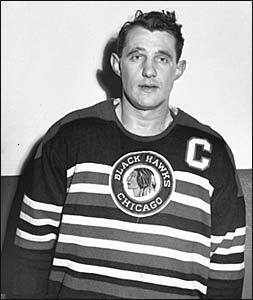 During his ninth season with the Black Hawks, on November 23, 1954, Bill was dealt to the New York Rangers, along with Pete Conacher, with Chicago receiving Rich Lamoureux, Nick Mickoski and Allan Stanley. 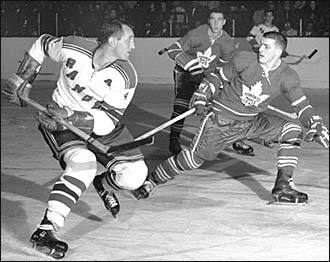 He was a rock on defence for the Rangers, earning First Team All-Star selections in 1956, 1958 and 1959, and a Second Team honour in 1957. In 1955-56, Bill's 51 points placed him eleventh in NHL scoring. In 1957-58, his 46 assists set a record for defencemen that stood until Bobby Orr earned 87 assists in 1969-70. Following the 1958-59 season, Gadsby was runner-up to Montreal's Tom Johnston for the Norris Trophy as the NHL's top defenceman. Jack Adams, general manager of the Detroit Red Wings, had long coveted Gadsby and felt he may have been the ingredient that propelled the Red Wings to a Stanley Cup championship. On February 5, 1960, Bill and Eddie Shack were dealt from New York to Detroit for Red Kelly and Billy McNeill, but the trade was scuttled two days later when both Kelly and McNeill refused to report to the Rangers. After serving one more season in New York, Detroit finally acquired Gadsby on June 12, 1961, sending Les Hunt to the Rangers in exchange. "Coming to Detroit, I thought it was going to be a chance to win it all," admits Bill. "We had some tremendous teams." Wearing Red Wing red and white, Gadsby was able to accomplish several milestones. On November 4, 1962, he became the first NHL defenceman to collect 500 points. In 1965-66, Bill (as well as teammate Gordie Howe) entered his twentieth NHL season, joining former Boston Bruins' star Dit Clapper as the NHL's only veterans of twenty seasons. "It had been a goal of mine to play twenty seasons," Bill says. That season, he was named to the NHL's Second All-Star Team. "I was going to come here (to Detroit) for a year and then go back to Edmonton where I lived in the off-season. I was going to coach the farm team there. Instead, I got a new life and I lasted another five or six years with the Red Wings." But as hoped, Bill's Red Wings charged towards a Stanley Cup championship. In 1963 and 1964, Detroit went to the Stanley Cup final, only to lose to the Toronto Maple Leafs. In 1966, the Red Wings again clawed to the final, this time, facing the Montreal Canadiens, but again, they were thwarted. "You can't dwell on the disappointment," Bill shrugs. "I had a wonderful career and got to play with some great players." Bill Gadsby retired following that six-game series against the Canadiens. The rugged blueliner completed 1,248 regular season games, scoring 130 goals and 568 points. Bill retired as the all-time leader in games played, points and penalty minutes (1,539) for a defenceman. "I could have played a couple more years but the body was talking back to me," he laughs. "When the body starts talking back to you and you can hardly gets the legs out of bed next morning, it's time to quit." Bill reflected on an outstanding career that saw him named one of The Hockey News's Top 100 NHL Players of All-Time, and in 1970, a member of the Hockey Hall of Fame. "In reviewing my career, I'm proud that I left the NHL as the highest scoring defenseman in NHL history. I'm more proud of the fact that Gordie Howe and I were the first players to play 1,000 games. In the days of Original Six hockey, to play through injury, pain and discomfort was expected as much as it was admired. The tradition passed down from generation to generation. When I came up with the Black Hawks in 1946, I watched John Mariucci slather liniment over his body to reduce the pain he would endure just to play. He played on nights when he could barely walk into the dressing room. He was the toughest man I ever met. I feel quite good that I left the game with a reputation of a man who played through many injuries. When the Red Wings acquired me at age 34 in 1961, (Boston Bruins' great) Eddie Shore said, 'He will play three to five more years. He is virtually indestructible.' That kind of praise means plenty to me because it meant that I never cheated on my effort." Kevin Shea is a hockey historian, and Editor of Publications at the Hockey Hall of Fame.